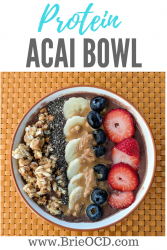 Acai is a Brazilian berry that is hailed as a superfood packed with antioxidants and fiber. I have to be honest…. I am not a huge fan of acai bowls. Not because they aren’t delicious… oh they are! But they aren’t really “healthy”. They are advertised as healthy and a weight loss aid, when in reality they are loaded with carbs and sugar. That being said, this California staple isn’t going anywhere (and I do think they are delicious), so I wanted to see if I could make a healthier version. 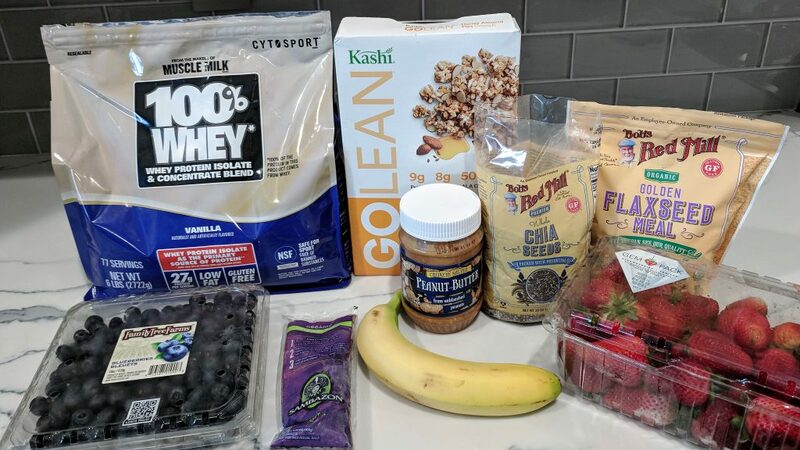 My Protein Acai Bowl is 425 calories , 55g carb, 21g protein, 12g fat (all healthy fat from the natural peanut butter). I added 3 tbsp of vanilla whey protein to the blender to give this recipe a boost of protein. I also added flaxseed meal (my new favorite accoutrement) because it doesn’t change the flavor at all and it gives you a dose of Omega 3 essential fatty acids (so do the Chia seeds that are used as a topping). I also used Go Lean Crunch cereal instead of granola because even though it is still high in carbs, it also has more protein and fiber than granola. You get the crunch without it being totally meaningless (stay away from granola people! that’s another one of those “healthy” foods). PRO TIP: use the Go Lean Crunch on the left or right side of the bowl so that you don’t use as much (see photo). To make this recipe gluten free, use your favorite crunchy gluten-free cereal OR find gluten free granola such as Back to Nature or Kind. I did make this recipe healthier than your run-of-the-mill Acai bowl, however don’t go making this your daily breakfast! There is a time and a place for everything and like I always say, everything in moderation. 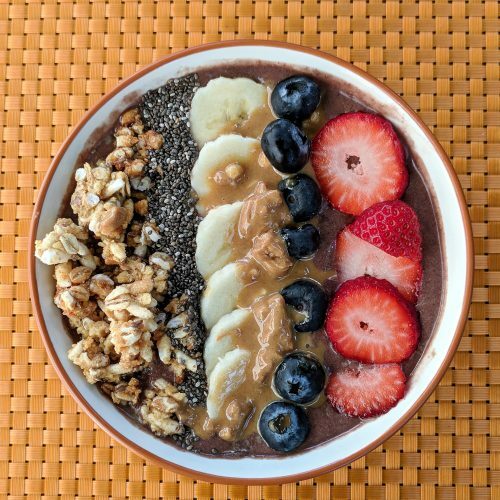 If you are craving an acai bowl on hot summer’s day or after an intense workout, this is just the recipe for you! run acai packet under hot water for about 30 seconds. add the acai packet, banana, protein powder, flaxseed meal and ice cubes in the Ninja single serving cup (or your blender of choice). use the blender to mix all of the contents together for about 45 seconds. add contents to a bowl. Top with all of the toppings above OR your favorites!